This is obviously an insane thing to post on of all things an Instagram video of Sam Smith releasing the art to his new music video, but it also made me legitimately laugh out loud. The chain mail text/email/comment is a strategy as old as time, but this one automatically moves to the top of my list because it’s so vague and specific at the same time. It starts off specific: “post this on 15 other posts”, then gets very vague: “and you will be kissed”, then gets very specific again: “if you break the chain you will see a demon in 53 minutes”. Copying that comment on 15 other posts isn’t that difficult, but you have to make sure you’re posting it on celebrity posts where it can get lost in the comment shuffle and not your friends post where it’s the only comment and you look insane. The kissed thing creeps me out more than the demon thing if I’m being honest. It just says “you will be kissed”. By whom? I don’t want to share this comment to 15 different Instagram’s and then head out to the market and have some old man come over and try to kiss me. I’m not sure why my head jumped right to that specific scenario but it did and I really don’t want that to happen. You can’t post a comment like this and just be that vague in the middle of it. I want to know who I’m getting kissed by when I spread this propaganda around. If you know a demon is going to come 53 minutes after I refuse to share this comment then the least you can do is tell me who’s going to kiss me. 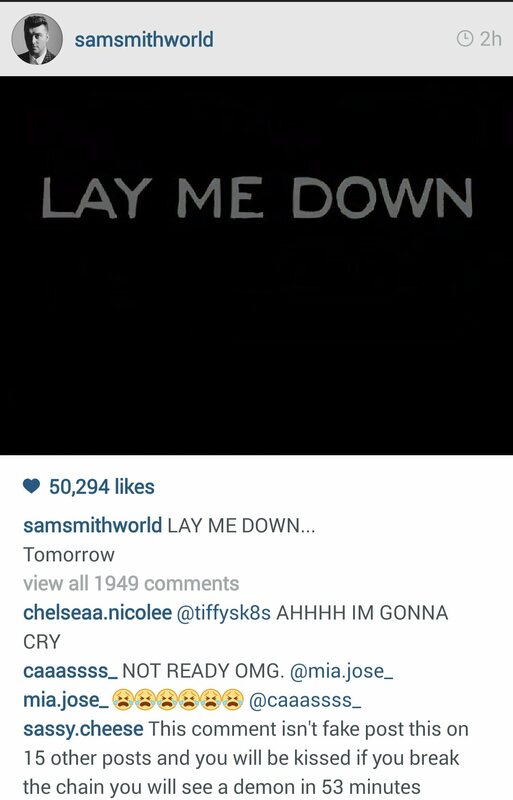 Posted on February 5, 2015, in Average Blog Posts, Insane Instagram Comments and tagged insane instagram comments, lay me down music video, sam smith, sam smith instagram. Bookmark the permalink. Leave a comment.